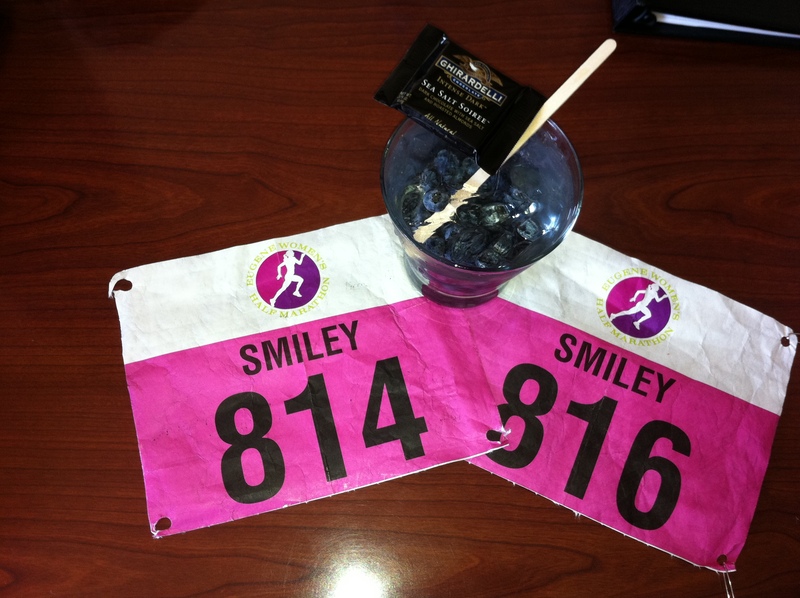 In 2013, I trained for a marathon. 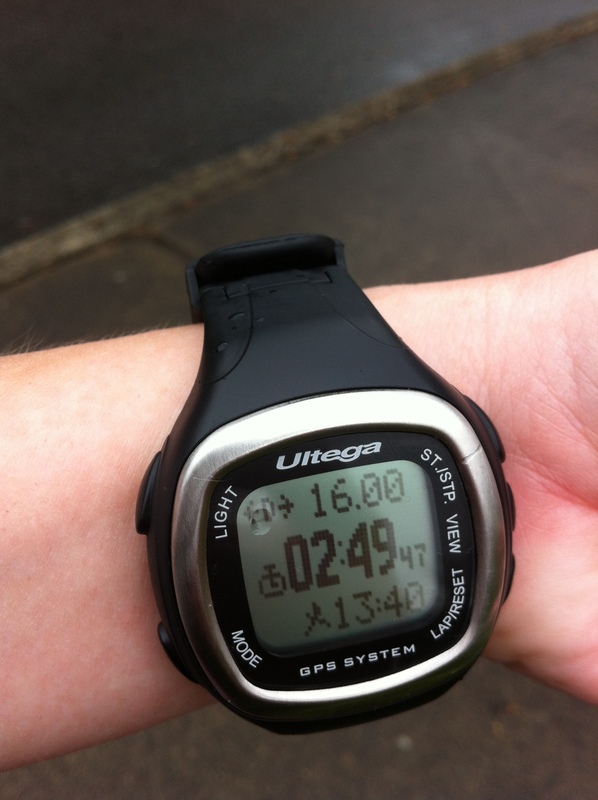 This watch shows the longest run I ever made it on- 16 miles in two hours, 49 minutes, and 47 seconds. It was the craziest running year of my life, but also the end of my running any real amount of miles. My goal this year is to get back on it. I had been running off and on for a few years, and somehow got it in my head that with two half marathons under my belt, I could totally train for a marathon. I started building consistency in late 2012, and worked up to a 20 mile week in about five months. Then I started adding on mileage a little at a time. I had some rough patches, but I really kept on it pretty well. The marathon was in the beginning of October, so I signed up for a half marathon July 4th to keep me on track. The half marathon was glorious. It came with the usual inconveniences- get up at the crack of dawn, drive around in the dark, take some sketchy shuttle bus, wait around, etc. After all that, the run was fantastic. My goal was to finish in two hours and 10 minutes, for solid 10 minute miles (for me, that was fast). My eventual goal was to finish the marathon with 10 minute miles, but I knew at my current pace that would be a stretch. I killed it though! I finished in exactly 2:10 (and some seconds, but I don’t recall what they were). I was really motivated and kept training with a vengeance. Sundays were long run days, and I no longer drank on Saturday nights. After my run I would take a long salt water bath. I was sore all the time, but I loved it. I had consistently started to feel some pain in my right calf on my runs, but it wasn’t too bad and I ignored it. Running always hurts, was my line of thinking. On the last long run I ever did, it became a stabbing pain. I hobbled at times, but I kept running. I figured I could power through. I was wrong. We lived in a second floor apartment at the time, and I barely made it up the stairs. I will say, I think my time on that run was pretty awesome, considering all of that. I thought I could soak it out with epsom salt, but I couldn’t. I ended up going to the ER, and found out my calf was torn. I went to physical therapy and tried to convince myself I could still run the marathon, but it was late August. I had six weeks. I kept trying to heal it and run at the same time. Obviously that didn’t work out at all, and I was devastated. It took months to heal. Last year, when I finally decided it was healed, I started running again. Then I got runner’s knee in BOTH knees. More physical therapy, and at that point I decided running was costing me too much money. I am, however, convinced that the runner’s knee was from gaining weight. My current plan is to lose 20 pounds and then start running again. Maybe now I can do just a mile at a time? Does anyone have an opinion about this? I would love to start up again. I also want to tell y’all who run- please don’t ignore a pain if it is consistent. Stabbing pains are the most dangerous, because those signify that something is tearing (unless it is a cramp). Let it heal, and don’t undo all of your training like I did! 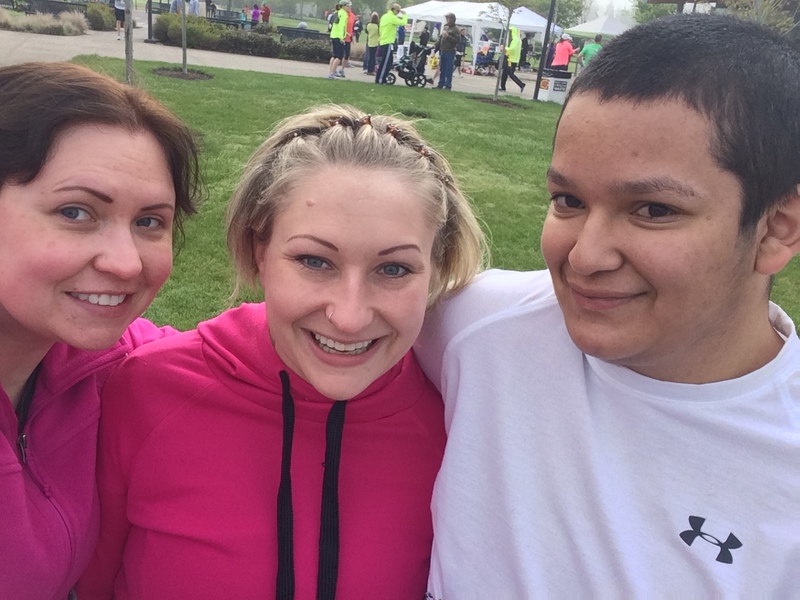 This is me with some of my siblings (I am on the left), before we did a 5k together last year (my brother’s first!). In 2008, I had never done more than the mile they used to require in P.E. class (I’m not sure, but I don’t think they do this anymore?). Even then, I would whine and moan and walk most of it. I was always one of the last to finish. My whole life I had accepted that I would never be athletic. I could never climb that evil P.E. rope, either, for the record. I could barely even dangle at the bottom of the rope. The kids that could were like circus acrobats to me. Books were my area of expertise, and I was fine with that. Suddenly, some other girls at work wanted to run a four mile Turkey Trot. I thought the idea was preposterous, but was intrigued by the idea of getting a work out before pigging out on Thanksgiving. I signed up and meant to train, but had no idea how. I essentially didn’t train at all, but managed to run a good portion of the race. Apparently the other cardio I was doing helped me through! I couldn’t believe it. I wanted to do more. When I tried to run on my own, I failed massively. Then I heard about Couch to 5k. It seemed to me like it was for wimps because it involves a lot of walking in the beginning. It turns out, running is really hard, and alternating running and walking is perfect for a beginner. The workouts were hard for me, but worked perfectly. I can’t even explain to you how proud I felt the day I ran two miles without stopping. I thought I might cry. I told everyone I knew (for the record, most people are not impressed by this. I have no idea why. I am very impressed!). From there, I just kept adding more. My sister signed me up for a half marathon, but I wasn’t ready. I switched to an 8k. I did a 10k, and eventually (after running for a few years) two half marathons. I have never been fast, but I was happy just with the sense of accomplishment it gave me being able to cover the distance. Tomorrow I will tell you my full marathon story, because I don’t want to make this too long. Who else loves to run? Well… maybe I have a love/hate relationship with running, but it gives me a feeling that no other work out can. Am I the Only One Addicted to Magazines? Once upon a time, there was a preteen girl that wasn’t allowed to read magazines. They were a waste of money. Even if they were free, they were usually not appropriate for a preteen girl. A few years later that girl grew up and had her own money. For a while, the magazines still seemed like a waste of money. $4.95?! You have to be kidding. That doesn’t even make sense! It takes an hour to read the thing and then I pass it on to a friend! Absurd. Eventually I figured out that subscriptions are much less expensive. I started with just one subscription. I loved reading Cosmopolitan every month (by the way, this was in my 20s. I now completely see why my mom didn’t want me reading this stuff as a kid. Some of it is shocking!). Reading magazines feels decadent to me. This may be because they were such a novelty growing up, but I think part of it is how much I value the written word. I read every article, cover to cover. I dream over the fashion, pretty make-up, sculpted bodies, and general gorgeousness. I dream of living in a big city and writing for a magazine. I picture glamour, but I’m sure it’s really all the Devil Wears Prada style grunt work. Here’s where it got me in trouble. With sites like Groupon, I can get a subscription for a year for $5. Somehow magazines are just a trigger point for me. Every time I see a deal on one, I want to buy it. One time I figured out I had 13 magazine subscriptions! This year I meant to cut down to three, but somehow I still have everything pictured above coming to my house. I can’t completely figure out why I love them so much, but I do. I do know that part of it is holding them in my hands. I had a subscription on my iPad once and never once read it. I worry that the physical written word is going away. Newspapers and magazines are disappearing. Even textbooks are going digital. That makes it all the more precious to me. 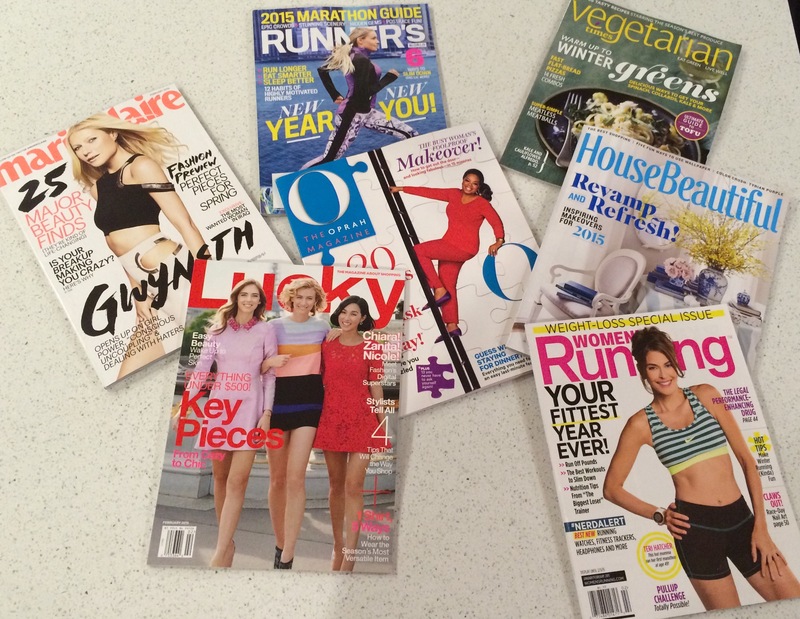 Women’s Running– best running magazine ever. For women by women, so empowering and inspirational. I decided to only renew one of my running magazines, and it was this one. Runner’s World– great articles and advice. I wanted both running magazines when I was training for a marathon (that I never ran- another post for another time). Side note, I have tried Running Times and found it so dry and more for coaches. Does anyone else feel the same way? O– I think Oprah is the best for general interest. She’s so relatable, and has great content on budgeting, fashion, beauty, current events, etc. It’s always something new. This has been a keeper for me for many years. Marie Claire– I didn’t renew this one, but then a friend gifted me with a subscription. I actually had missed it, so I am glad she’s an enabler! I like their fashion spreads and columns. Vegetarian Times– this was a killer deal. I love to read their recipes, and it makes me happy that they are catering to vegetarians. However, I’ve only actually made one recipe, so I probably shouldn’t renew? House Beautiful– this was another $5 subscription. We just moved and I thought it would be really fun to look through these, but I have two and actually haven’t looked at one yet. Lucky– I was planning on Lucky being my only fashion magazine this year. I’ve loved it in the past because they actually feature affordable pieces, but I’m finding this isn’t as true as it used to be (I just subscribed after not reading for a few years). Is this my imagination? I still like it, but I think I should only have one fashion subscription. Can I have two? I am terrible at minimalism when it comes to magazines. I don’t keep them when I’m done with them. I do my best to give them to someone else to read, or recycle them. Still, it’s definitely consumption. Can anyone help me narrow it down? What is a reasonable amount? What are your favorites? Free Excel Running Log/Exercise Journal! A little over a year ago now, I quit running. I mostly quit due to two different injuries, but I can’t blame it just on that. I lost motivation and focus. In that time I have gained 20 pounds. I looked over my journals and it’s super obvious how this happened. In 2014 I stopped even bothering to track in the end. The evolution is a bit appalling, but it gives me a clear picture of where to go from here. Do you want to track your workouts, too? You can use the below Excel file to input your workouts. If you total the weekly miles (or kilometers) in the mileage column, the formula at the bottom will keep a running total for you. I also like to use my spreadsheet to note how many miles I have run in each pair of shoes. I usually switch them out at about 300 miles. Some people go longer than that, but my knees and shins get hurt easily, so I like to play it safe. I filled in the first two rows as a sample- just clear these out and you’ll be good to go! If anyone doesn’t have Excel and wants me to email a PDF or convert it to something else, just leave me a comment. Let’s get in shape!